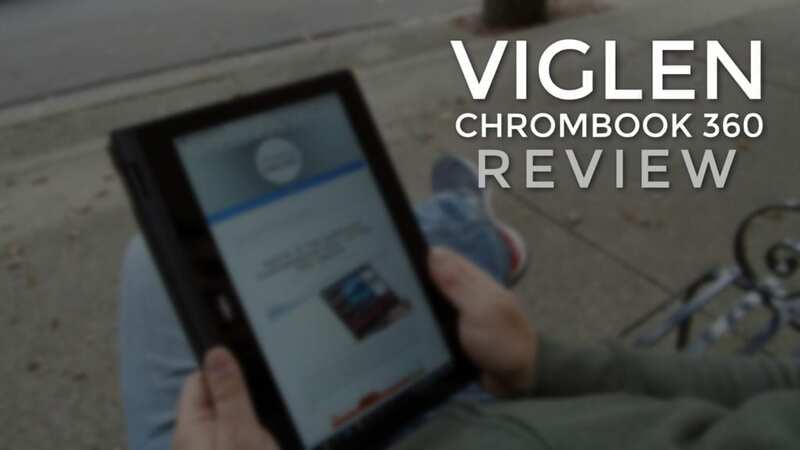 Joining us all the way from the UK, the Viglen Chromebook 360 has impressed on many fronts. Though not aimed at consumers, the device has quite a bit of appeal for those in search of a decent performer with the ability to stand up to some pretty serious abuse. As this device is aimed directly at the education market, there are a few things we need to keep in mind as we talk through the good and bad here. Its weight and build, most notably, are heftier than most consumer models at this point and this is most definitely on purpose. We can all remember being a child and many of us have kiddos of our own. It’s very easy to see that kids are hard on tech. As we keep that point in front of us, some of the design choices of the Viglen become pretty clear. The Viglen Chromebook 360 isn’t going to win any awards for stunning design, but that isn’t to say it isn’t a reasonably attractive device, either. The best word for it, much like the recently-reviewed Lenovo Thinkpad Chromebook 13, is functional. The outer shell is plastic, but firm and does a good job resisting fingerprints. It isn’t the thinnest device nor the thickest. At 292mm x 209mm x 22.5mm, it simply feels average in size. Weight is a bit of a different story. The device is heavy and there’s no way around that. At 1.6K or 3.5lbs, this guy is hefty. Again, I reference the target audience of the device. Part of this device’s design is a splash-proof design and drop resistance. Those things don’t come without added bulk. But for the intended audience, it’s a worthy trade-off. While 3.5 pounds is heavy for laptops these days, it’s not even close to something like the Acer Chromebook 15. That device comes in at a whopping 5 pounds and in a backpack, it’s never really bothered me. The clear attraction here is the 360-degree hinge. It performs as expected, giving the user access to tablet, stand, and tent modes. Since Lenovo’s original Yoga devices hit the market a few years ago, the 360 hinge has become pretty standard. It works and does what you need it to. I’ve recently become a real fan of this form factor, and you can read here to see why. All in all, the device is very solid and feels like it could take a beating and likely win. It will survive many days in the classroom. Around the outside, most of the standard ports and such are present with a few welcome surprises. First up, on the right side we have 3 USB 3.0 ports right in a line. Most Chromebooks ship with 2 USB ports, one 3.0 and one 2.0. This is a welcome addition. Other ports include a micro SD card slot, combo headphone/mic jack, and full-sized HDMI port. Downward firing speakers get the job done without getting muffled in any orientation of the convertible and are quite loud and clear. One thing we rarely cover is the physical battery. Sure, large batteries are great. We like and talk about battery life a lot: 10 hours in this guy. While that is solid, the interesting part is this battery is swappable. A pair of simple flat-head screws hold the battery in place and could be undone with all sorts of blunt instruments, including a screwdriver. The point is, it’s a thoughtful addition. Batteries don’t have the best longevity, so the ability to quickly swap it will be welcome in many classroom situations. Another very big surprise has been the Viglen’s screen. Being honest, in the education market, screens can be an oft-overlooked part of the hardware. Poor viewing angles, washed out colors, and low brightness plague education devices most times. I’m glad to say that the Viglen Chromebook 360 has none of these issues. The display, an 11.6-inch 1366×768 panel, is vibrant and clear. Viewing angles are fantastic and overall the colors look great. It isn’t the brightest display on the market, but is on par with other IPS panels on much pricier Chromebooks. At 11.6-inches, the 1366×768 resolution fits very nicely. We all like high-res displays, but for this device and its internals, it works together very well. The glass covering also goes edge to edge and provides a great surface for all the great touch-oriented activities Chromebooks simply keep getting better at. This will come in very handy when Android apps begin showing up later this year. As with all 16:9 displays, the tablet mode in portrait feels a bit odd. 16:10, 3:2, and 4:3 do this much better, but are a bit less productive in laptop mode. It’s not a deal-breaker and isn’t a problem unique to the Viglen, but we love seeing touch devices with 16:10 (or more square) displays. Another great surprise here is the quality of the input methods. We’ll start with the keyboard. Most education devices ship with mushy, unresponsive keyboards. We’re happy to say that the Viglen has no such issues. Instead, we were met with a keyboard that has decent travel and very clicky Keys. The typing experience overall has been very, very good. The only issue we had was user error, as the keyboard is laid out for UK students. Our fingers weren’t quite ready to adapt to some of the different key placements. This doesn’t take anything away from the quality of the input method, however. The trackpad is equally impressive. They’re not made of glass, the plastic used on its surface is highly resistant to fingerprints and remain smooth after hours of use. The click mechanism works very well, not showing any of the issues we’ve seen in other Chromebook track pads. The build was very tight and multi-finger gestures work as expected every time. Once again, we came away surprised and pleased. Yet another surprise from this device is its performance. Granted, the screen’s resolution helps a bit in this department, but we must say the Braswell chip is holding its own. The score on octane of roughly 9000 shows that this Chromebook can handle almost all tasks effectively. Day-to-day showed very little slow down with multiple tabs open and applications running in the background. For most students, this device will handle everything they can throw at it. The inclusion of 4 gigs of RAM and 32 gigs of internal storage at the base model are also a nice addition. More and more, I’m finding that 4 gigs of RAM is pretty much all most users will ever need. Gone are the days where I felt that 8 gigs of RAM were required. For consumers and manufacturers alike, this is a great step forward. Battery life has been very good as well. We are seeing around 9 to 10 hours of use at 75% screen brightness, so with a little less brightness, 10 hours would be totally achievable. With the ability to swap the battery relatively easily, you could even keep an extra battery on hand for field trips or other times when a charger is not available. That is not something you can say of most other Chromebooks. Overall, the Viglen Chromebook 360 has been quite full of surprises. Perhaps the aim at the education market caused me to assume that this device would be very budget-class. While there are no flourishes or ultra-thin form factors here, this device performs in all the right ways. A pleasant screen, 360-degree hinge, great keyboard and trackpad make for a fantastic experience. My dissatisfaction with Braswell has been cured with this one as well. The performance was never really an issue. While consumers may not see this device any time soon, it is a great sign of what the Chromebook market is beginning to offer in a very reasonably-priced package. With a little marketing, I’d expect Viglen to sell a ton of these. And that means there will be tons of students getting a fantastic Chrome OS experience in the months to come.